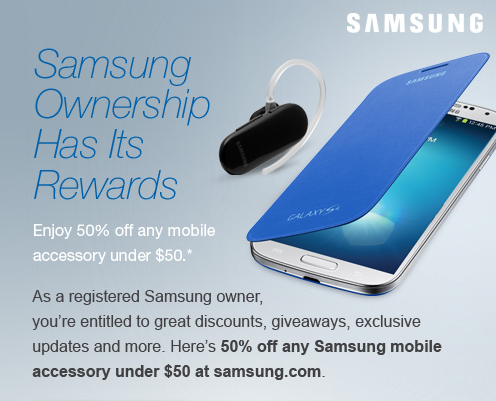 If you made the Samsung Galaxy S4 your device for the time being, feel free to take advantage of this 50% off coupon promo through Samsung’s site. All you have to do is create an account (if you haven’t already) and register your new device (need the IMEI) – within a few minutes, an email will arrive with your code. The code is good for 50% off of any accessory in their store that is $50 and under. That may limit your options, but things like the new spare battery and charger kit, multimedia desktop dock, and Flip Covers are all under $50. Via: Samsung Cheers Brendan! Samsung Galaxy Tab 2 10.1 With Accessory Bundle for $279.99 Today Through Woot!